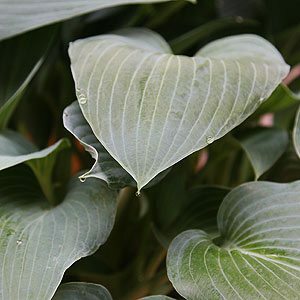 With a nice upright habit and wonderful blue green foliage Hosta Halcyon will reach a good size with a height of around 30cm, the leaf colour makes it probably the best blue green hostas of all. Foliage is thick and textured and in fact it is a little more ‘snail resistant’ than many other varieties. The bell shaped lilac flowers are attractive for a hosta however it is the long heart shaped leaves that are the star attraction. We like to use Hosta Halcyon to plant in front of Camellias in the shady border. Plant them out near the dripline. They are also excellent for those shady positions next to buildings where other plants struggle. Forming a nice clump over time and equally at home in a container or in the garden a humus rich moist soil is essential. Protection from hot sun and good drainage are important. After flowering the spent flower heads can be cut back to neaten up. As the foliage dies back it is worth removing the dead foliage and cleaning up around the plant to remove the hiding places for snails. Height – Generally to around .5 metres in height. Spread – This is a clump forming perennial and will happily spread to around 1 metres over time. Position – Morning sun with afternoon shade, or dappled shade all day. Soil – Humus rich with moisture. Foliage – A blue green heart shaped but pointed. Flowers – Blue Lilac to purple. Hosta Halcyon grows well in containers as long as they are in the shade. Use a premium potting mix and fertilise every spring. We suggest using some copper snail and slug tape as a barrier, two bands a little apart 2/3 of the way up the pot.